The popular kirtan band, Ashraya, were invited to Darwin to be part of the festivities to celebrate International Day of Yoga. 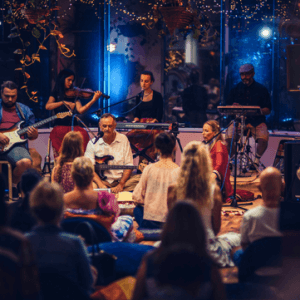 Over 4 nights, they brought peace and joy to the Darwin yoga and Hindu communities through the power of kirtan. 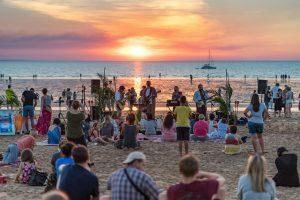 The first night (Thursday 21st June) of kirtan was at the famous Mindil Beach Sunset Markets down on the beach as the sun sets. Hundreds of people listened and even participated in the kirtan! The kirtan was also livestreamed on Facebook and people from around the world joined in and commented how beautiful it was. Friday night was hosted by a local vegan cafe, Kings Wholefoods Artisan, and approximately 100 attended Ashraya’s Mystic Journey, a soundscape of pranayama, mantra, mindfulness and kirtan. A delicious pure vegetarian meal was provided by our hosts followed by ecstatic dancing and chanting of the sacred mantras. There were two events on Saturday. The first was Yoga Day Festival where Ashraya concluded the asana practice with heartwarming, peaceful kirtan. Participants were mesmerized and expressed how wonderful it was to end a yoga practice with such a beautiful meditation. Ashraya then played at the Yoga Day Festival after party where approximately 50 people attended. Ashraya started with a gentle guided meditation which then built into an ecstatic dance. Everyone was so happy with big smiles all around. One of the band members, Radha Krishna das gave a talk on breaking bad habits and how the yoga system can break these by completely satisfying us within. The band also led more beautiful kirtan with approx 100 people in attendance. A delicious dinner was provided by the event volunteers. Darwin! we look forward to Ashraya again in the future!